By Jeff Aranow: Matchroom Sport promoter Eddie Hearn has already started mapping out IBF/WBA heavyweight champion Anthony Joshua’s fight after his next one against Kubrat Pulev this month on October 28. Hearn plans on having Joshua fight outside of the UK abroad in possibly Las Vegas or the Middle East before matching him against WBC champion Deontay “Bronze Bomber” Wilder in a unification fight. Hearn has Joshua’s immediate future mapped out for him to unify the world titles. Joshua’s immediate fight after Pulev will likely be against WBO heavyweight champion Joseph Parker in Las Vegas in early 2018. If Joshua can beat Parker, he would then hold 3 of the 4 heavyweight titles in the division. The last remaining belt, the World Boxing Council title held by Wilder, would be the one that Joshua would go after in his second fight of 2018. Hearn is waiting to fight out from the World Boxing Association whether #1 WBA Luis “King Kong” Ortiz (27-0, 23 KOs) is still the mandatory challenger for Joshua (19-0, 19 Kos). Ortiz was supposed to fight Wilder on November 4 in New York, but his failed drug test caused him lose that fight. Joshua has already been ordered by the WBA to face Ortiz next. With the positive drug test, Ortiz’s status as Joshua’s mandatory challenger is a murky one at this time. Hearn isn’t saying that he doesn’t want to match Joshua against Ortiz, but he doesn’t appear to be excited at the prospects of making that fight. If the WBA says Joshua will need to fight Ortiz in his next fight after the Pulev contest, then Hearn will likely make that fight for Las Vegas, Nevada. Ortiz lives and fights out of the U.S, so it’s a logical place for the Joshua-Ortiz fight to be staged. The WBA keeping Ortiz as the mandatory challenger for Joshua would slow his progress towards unifying the division. Instead of Joshua being able to fight Parker in his fight after the Pulev bout, he would likely need to face Luis Ortiz to satisfy the WBA’s order for him to take that fight. Ortiz is certainly up there in age at 38, but he’s still a dangerous fighter due to his punching power, southpaw stance and boxing expertise. Ortiz is a well-schooled fighter from the Cuban national team, and he’s probably forgotten more than Joshua has learned at this point. When Ortiz is at his best, he’s capable of giving his opponents numerous different looks. Ortiz blends in effortlessly into a number of different styles, and it’s very hard for his opponents to adapt to all the things he can do in the ring. Even if Ortiz is only 75% of what he once was, it might be enough for him to beat Joshua. Ortiz’s power still looks to be as good as ever. He hasn’t lost his power at all. It’s important for Joshua to fight in the U.S if Hearn wants to build the fight up in that country and make it a pay-per-view bout. Joshua-Wilder is an obvious pay-per-view match on Sky Box Office in the UK, but it’s a different story in the U.S. Joshua has never fought in the States, and the casual boxing fans aren’t going to automatically want to pay to see Wilder fight a guy they’ve never seen or heard of before in the 27-year-old Joshua. Wilder isn’t even a big star in the U.S despite having fought almost all of his fights in that country. Joshua fights his IBF mandatory Kubrat Pulev (25-1, 13 KOs) on October 28 at the Principality Stadium in Cardiff, Wales. 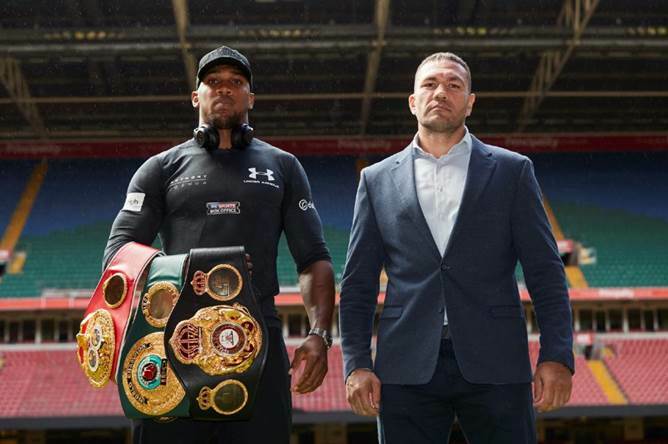 The Joshua-Pulev fight will be televised live on Sky Box Office in the UK. Joshua is a big favorite to win the fight. Pulev, 36, has beaten before by Wladimir Klitschko in 2015 in getting stopped in the 5th round. Hearn is trying hard not to overlook Pulev as an opponent for Joshua, but it’s obviously hard for him to do that. Pulev has done nothing in recent years that suggests that he’s capable of upsetting the applecart and beat Joshua. But it’s always possible for a guy as big and as experienced as Pulev to get lucky when he gets inside the ring with Joshua. If Joshua can emerge from 2018 as the unified heavyweight champion of the division, he would become a major star worldwide. Just adding Wilder’s name to his resume in the win column would be a big deal for Joshua. If Joshua can beat Parker, Wilder and possibly Ortiz all in the same year in 2018, it sends his career onto the stratosphere of boxing. It’s easier said than done though. Joshua had problems in his last fight against Wladimir Klitschko on April 29 at Wembley Stadium in London, England. Despite fighting in front of over 90,000 boxing fans, Joshua was knocked down in round 6. The fight could have been over for Joshua if Wladimir had put in a token effort to end it right then and there, but he was too overconfident. Wladimir believed that Joshua was so tired that he wouldn’t be able to get back into the fight. Joshua did come back and stop Wladimir in the 11th. But the match showed that Joshua is vulnerable. Joshua getting past Parker, Wilder and possibly Ortiz in three consecutive fights will hard to do if the fights turn out to be grueling affairs for him. Joshua didn’t get hit all that much by Klitschko, because he was trying to focus on his defense much of the time. Ortiz, Wilder and Parker would be a lot more focused on letting their hands go. By the time Joshua gets to his second or third fight of the year, he could be worn down and not ready for yet another hard fight. If Wilder gets Joshua after he faces Ortiz, he’d have him in the perfect position to knock him out. It’ll be a different story if Joshua knockouts Pulev and Ortiz quickly. We still don’t know whether the WBA will keep Ortiz as Joshua’s mandatory challenger or not. That will be determined soon.